Autumn is one of the best times to plant, as new plants have the cold winter months (and rains) to settle in and develop root systems, preparing them to survive on less water during summer. Add impact to your autumn garden this month with our gardening tips that include spring-flowering bulbs to plant, pointers on pruning, and how-tos for preparing your garden for the upcoming cooler months. Choose a sunny area of the garden. The sun’s strength is less intense during autumn and winter, and your bulbs will need plenty of sunlight to ensure healthy growth. Well-draining soil is essential, so dig in plenty of compost and rake the soil evenly before planting. Small bulbs such as anemones, Lachenalia, tritonia, Ixia, ranunculus and babianas should be planted about 5cm deep, and spaced 5cm apart. Plant larger bulbs, like hyacinth, freesias and Dutch iris, 10cm deep and 10cm apart. Keep soil moist at root level. Soak your soil down to a depth of 15cm every 4-5 days, and mulch with compost or bark chips to help conserve moisture. Feed bulbs with bulb food once every two weeks for maximum flowering and foliage. Plant drought-tolerant plants such as bougainvillea, wild iris, yellow wild iris, spekboom, plumbago, Tulbaghia, Duinekraaibessie, Margaret Roberts lavender, pelargonium Geranium Maverick, leucadendron, Natal plum and rosemary. Sow winter veggies such as broad beans, peas, potato, cauliflower, onion and turnip. 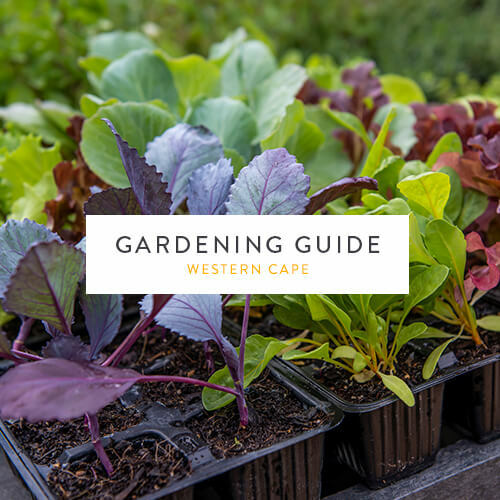 Sow and plant winter- and spring-flowering seedlings such as African daisies, sweet peas, Virginian stocks, cinerarias, snapdragons, lobelias, delphiniums, nemesia, pansies, salvias, violas, scabiosa and Flanders poppies. Plant strawberry runners and cover the soil beneath the plants with a layer of straw to prevent fruit from rotting. Feed azaleas, camellias and tea bushes with a handful of shake and grow. Mulch with compost before the rains. Feed container plants with Nitrosol to give them a winter boost. Feed sweet peas with 2:3:2 to encourage healthy growth and abundant flowers in the months ahead. Pinch out side-shoots to encourage upward growth. Feed citrus trees with a handful of magnesium sulphate. Inspect the leaves carefully for signs of citrus psylla or scale; if you see traces, cover the affected leaves with a generous dose of Margaret Roberts Organic Insect Spray. Prune evergreen hedges, summer-flowering shrubs and overgrown climbers. Deadhead your roses to keep them neat and encourage a final autumn flush. Tidy up dead branches and twigs on your plants to make space for proper air circulation and light. Cut back dahlias to 20cm above soil level. Wait two weeks before lifting the bulbs and storing them in a cool, dry place. The bulbs can be replanted in August. Instead of fighting the autumn leaf fall, fallen leaves can be left on the grass or in garden beds to form a nutrient-rich mulch for the garden. In time, they’ll break down and become food for the soil again. Enhance the quality of your soil during the colder months by opting for a slow-release fertiliser such as Dynamite and Osmocote. Strengthen your lawn and assist its growth into winter by feeding with a potassium-rich fertiliser such as Bio Ganic Lawns. Plant division is ideal to try in autumn; increase your favourite perennials by splitting them this month. Prevent damage to your plants by treating leaf miner invasions with organic Bioneem.